Our firm is a foremost name, involved in providing a diverse range of Liquid Fill Packaging Machine. Experts use the advanced techniques to develop this product as per client’s demand. Speed (Bag/min.) 20 – 40. Filling Cap.Gms/ml 10 – 100ml. Bag Size mm (RW) 150 – 330mm,(L) 70- 150mm. Seal Style 3/4 Side Seal. Measuring Method Liquid Dosage Pump. Power 1/2 & 1/4H.P. Single Phase 50 – 60 Hz Heater : 150W – 2Pc,200W – 2Pc, 300W – 2Pc,500W – 2 Pc. Laminate Structure Polyester/ Met/ Al Laminated Foil, Heat Sealable plain, Pearliest BOPP & any Heat Sealable Film Core Dia: 75 mm Max Outer Dia : 350mm. Weight Kg (gross) 480 approx. Dimension 1300 x 910 x 1560. Application For Packing shampoo, creams, Lotions, Tomato Ketchup, Sauces, pastes, Honey, Liquid Soap etc. 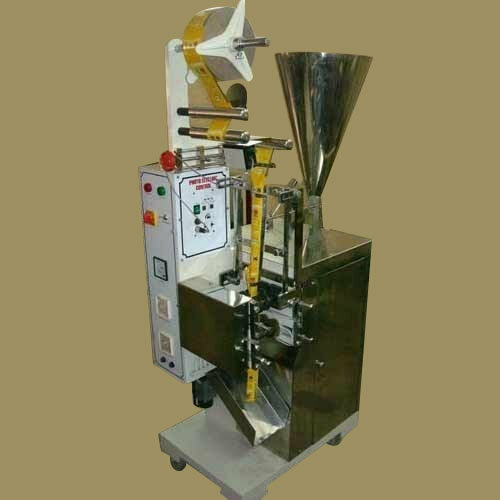 Incorporated in the year 2005, at New Delhi (India), we, “Idea Packaging” are a leading manufacturer of a superior quality range of Pouch Packaging Machine, Agarbatti Packaging Machine, Liquid Packaging Machines , Packet Sealing Machine,Tea Packing machine, Namkeen packing machine,Powder packing machine,Auger filler machines, Weight filler machines,Flow wrap machine,Pulses packing machine,Rice packing machine etc.These products are broadly acclaimed for their perfect finish, enhanced durability, excellent working, easy to use, low maintenance and corrosion resistance. In order to cater the precise requirements of our valuable clients, we offer the entire product range in a number of specifications as per their demands.